Chila: I enjoyed your essay very much. I would call it experimental. How do you come upon your ideas for essays? Do you keep them in a notebook and flesh them out later or write them immediately? Sean: I have a few small notebooks, but I use them infrequently. I use them when I’m working on something complex that I want to hold onto. Normally, though, I find an idea when I’m sitting at my desk. It might be from a book I’ve been reading (and then I might scribble a short imitation piece in the margins), from the day’s experience (maybe a snippet of conversation someone says, like “The infidelity of songbirds,” which later became a poem of mine), or from the view out my window of Turtle Cove, where Sarah and I live. ​“The Nouns of Assembly” was a mix of two of the above. I was looking out the window at some gathering of animals (maybe mergansers in the cove) and I started wondering what they were called as a group. So I looked it up and learned the term “nouns of assembly,” which is any noun that describes groups, especially of animals. Once I heard the term, I knew I needed to do something with it. Chila: There seems to be an emerging trend in our accepted pieces at EIR: nature/place/setting. Tell us about your place, where you live, and how your setting informs your writing. Sean: I live in northern Vermont on a small lake. Sarah and I moved here about two and a half years ago. And it’s the best move we’ve ever made. Our home is located on a smaller cove. We’re the only house on the cove. So we have lots of privacy and an abundance of wildlife: wood ducks, mergansers, mallards, loons, eagles, osprey, kingfisher, thrushes, mink, beaver, otter, muskrat, herons, the infrequent black bear, moose, coyote, and deer. But this micro-essay (some might call it a poem), “The Nouns of Assembly,” is actually about my time leading a trail crew in the Pacific Northwest back in the early 2000s. I was working with the Northwest Youth Corps, and I was in charge of leading a team of ten 16-19 year olds. It was a spectacular job, a great way to live in the wilderness for months at a time. But I saw our group as more than just a crew, we were a family. I wanted an essay that dealt with that idea, that showed our community. Chila: Education-wise & job-wise, have you followed your dreams to lead you to where you are today? Do you wish you would have done anything differently? Sean: I have been lucky enough to have followed every single dream I could imagine dreaming. I went to school in the Rocky Mountains at Western State College (the best college in America for big mountain skiing). There I skied and backpacked and mountain biked. Then I did the Peace Corps in Jamaica. Then I worked in the woods with the youth corps and got to work in Oregon, Washington, California, Idaho, Colorado, New Mexico, and Utah. Then after a life of not writing, I fell into writing and got my MFA. Then some more moving before ending up in the one spot I cannot moving from, Turtle Cove on our little Vermont lake with my wife Sarah. So, no, I have no regrets and I’ve lived many, many dreams. Now I get to live in the middle of nowhere, teach a few days a week, and write a bit. That’s perfect for me. Chila: You've had success in the creative nonfiction realm. What are 3 or 4 writing markets (journals) you want to ace in 2016? Sean: Rather than looking at it as writing markets that I want to crack, I just like finding good homes for my essays, poems, and stories. And it’s, I’m finding, about creating relationships, making community between me, my essays, the literary journals, and the editors. That’s what I most enjoy. That’s what I most want in 2016. The building of community. And that’s what is occurring right here in this Q&A. Until today, I haven’t had a chance to get to know you. Now we’re exchanging ideas. And that, to me, is the most fun. Building community. Chila: That's a fantastic truth, Sean. Ditto on that, and thank you. What else can you tell us about your writing process? Sean: For me, my writing process is pretty simple: come up with good idea, create a first draft that I think is pretty darn good, step away, come back, realize my draft is actually pretty mediocre, revise until I think I have something pretty darn good, step away, come back, realize my draft is still mediocre, repeat and repeat until I come back to it and think, Hmmm, I’m enjoying this piece. Then I start sending it out. But the key, for me, is that revision stage. It’s where I take a good idea and hopefully turn it into a working idea, a poem or essay that is lyrical, has a point, has strong images, all that stuff. And I’ll keep revising until the piece is published. So it’s never done. Sean: I only recently learned about you. I saw an ad in either Poets and Writers or The AWP Chronicle. I looked you up online, liked how you presented yourself, and thought I’d send you some of my more lyrical micro-essays. And I’m sure glad I did. Sean: The canoe in the picture is a beautiful Navarro with cherry wood on the interior. I'm not sure of the model. It's my in-laws' canoe. Rich and Marjorie Hingston let my wife and I use the canoe since we live on a small cove (called Turtle Cove) on a quiet lake in northern Vermont. I used to own a Wenonah 15' canoe, probably similar to your 17'er. It was a one-person beauty. But I sold it when I was living in MI and was far from rivers. I wish I hadn't. I'd love to still own that one person canoe. Sean Prentiss is the author of the memoir, Finding Abbey: a Search for Edward Abbey and His Hidden Desert Grave, which won the 2015 National Outdoor Book Award for History/Biography. Prentiss is also the co-editor of The Far Edges of the Fourth Genre: Explorations in Creative Nonfiction, a creative nonfiction craft anthology. 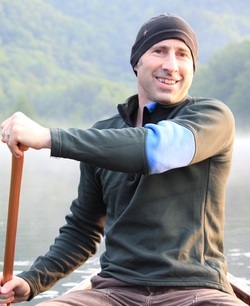 He lives on a small lake in northern Vermont and serves as an assistant professor at Norwich University.